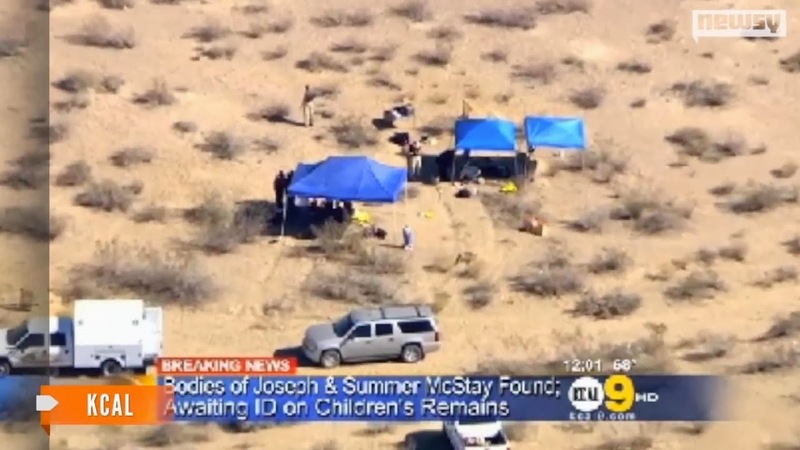 About a week after the McStay family graves were found, Michael McStay notified the police there were tracks leading up to the McStay graves. You can see the photos of the tracks by going to the Daily Mail link. I started asking around and doing a lot of researching to figure out what would leave tracks 67″ wide. Please keep in mind I do not know if Michael measured from the far side of the track to the other far side, or from inside to inside or even middle of the track mark to the middle of the other track mark. A Bobcat track width, meaning the measurement from one tire to the other is 40 to 50 inches depending on what type of Bobcat. 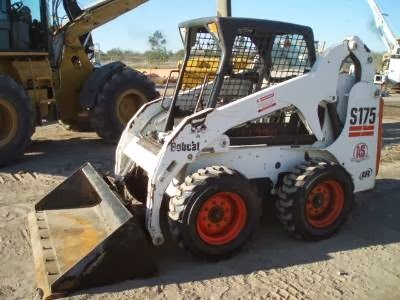 There is one a S175 Skid Steer Loader that has a track of 5.5 feet which comes out to 65 inches. This is pretty close to the 67 inches but you would have to put it on a trailer to get it to the location. If the trailer was backed into the shallow grave location the tracks would be too wide. So, the trailer would have had to have been parked elsewhere and then the Bobcat driven over to the area where the graves where made. More digging and I find that most four-wheel-drive pick up differentials are 65 inches wide. Getting closer, but not 67 inches. 54.5, 54.7 — 1983-’01 Chevy S-10 Blazer 2-dr., 1983-’01 GMC Jimmy 2-dr.
54.5, 54.7 — 1990-’01 Chevy S-10 Blazer 4-dr., 1990-’01 GMC Jimmy 4-dr.
You can see that these are not quite large enough, and a lot of vehicles can be eliminated as the cause of the tracks. So, I checked on some super trucks. A Toyota Tacoma 2011 track width is 63 and a Ram truck conventional cab is 65.7 front and 63.4 rear, 65.3 or 65.6 front, and a 64 for single rear wheels, and 68 for duals. All under the 67 inches. A Ram club crew cabs, w150 is 65.7 front, and 63.4 rear, w200’s are 65.3 for club cab, and 65.5 for crew cab, and 64.0 rear for both, which is also under the 67 inches. A Ram 2500/3500 Heavy Duty truck 4 has a front track width of 68.6 for a 4×2 and a 68.3 for a 4 x 4 and a rear of 68.2, which is a bit over the 67 inches. They I checked on a new Chevrolet Silverado and it has a front track width of 68.8 and a rear track width of 67.3 (finally something that is pretty darn close). 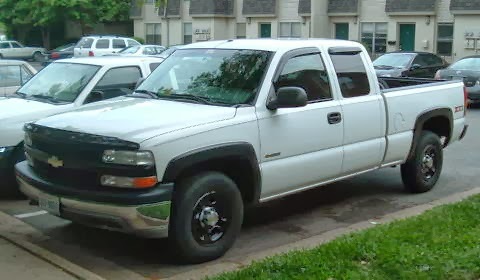 A 2010 Chevrolet Silverado front track is 68.1 in and 67.0 in. rear track. (The rear track is an exact match.) 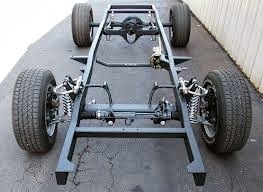 Then the Ford 250, and 350 front wheel tracks are 68.3 and the rear is 67.2 inches. Then I started thinking about Joey and Summer’s vehicles. A 2002 Isuzu Trooper’s width is, front 59.6 and the rear 59.8 so we know that this vehicle was not the one that left the tire tracks, but what about their truck. What is the track width for those tires? The McStay’s truck was a Dodge truck, so I looked at the track width for those vehicles. The track width of a 1991-1996 Dodge truck is 69.4 inches. So it looks as though the closest match is a Chevrolet Silverado or a Ford 250 or 350. If we go by what Michael is saying, could the person responsible for the deaths of the McStay family been driving a truck with a trailer in back with a Bobcat sitting on it? Checking on an average trailer that would be used for a bobcat, they are 18 foot in length and the width is average about 77 to 80 inches. As I mentioned above, this is too wide for the 67″ wide tracks. 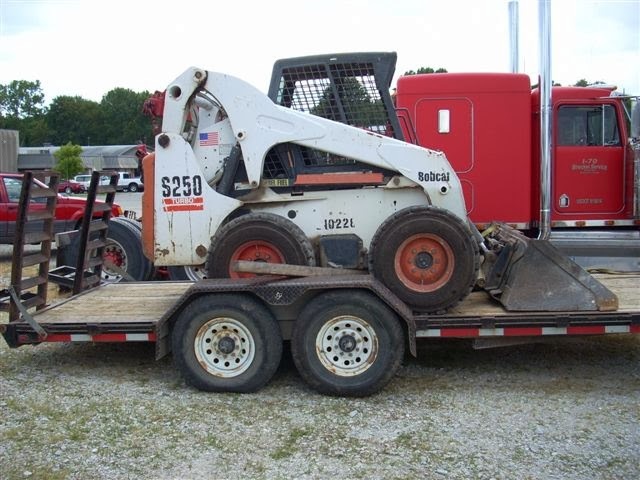 The SkidSteer Bobcat would be exactly the right width for the 67 inch tracks, but the the trailer hauling it would have wider tracks. The only way this would be a great match if we assumed the trailer and the truck towing it was parked elsewhere and the Bobcat was driven off the trailer and it made the tracks as it was digging the graves. But this leaves another big question. Why were the graves so shallow if someone was using a Bobcat to dig them. With a Bobcat it would have been easy to dig the graves so deep that nothing would have ever been found. I believe because the graves were so shallow they must have been dug by someone using a shovel. This leads me to the conclusion that it was probably a Silverado or F250 truck, possible white (as a neighbor mentioned seeing a white truck) that was used to transport the McStay’s. Whether they were transported in the cab of the truck or the bed is still unknown, but if in the bed there would have had to have been something in the bed of the truck to cover them, like firewood or a tarp. I do remember hearing there was sheets and blankets missing. Could Summer have been attacked and strangled to death in the home, then her body was put into the bed of the truck wrapped in sheets and blankets. To get Summer into the bed of the truck unnoticed, the truck would have to have been parked in the McStay garage but we know that was not possible because the garage was full. Maybe the person would have had to have waiting until dark to put her body in the truck or possible early in the morning before the sun came up. I heard that one person had been found in the grave with their hands tied, if this is true, could it have been Joey because Summer had already been killed? With Summer in the back of the truck there would be room for the two boys and Joey in the cab with a driver. If we assume the act was not premeditated but maybe someone that got angry, the person had a limited amount of time to get back to their home and establish their routine before anyone noticed they were gone. If they left the McStay house by nightfall (in February 2010, the sun sets around 5:20 p.m.) and drove to Victorville, which is an hour an 40 minutes a way (with no traffic) is there a possibility they could get back in time to drive the Trooper to the border at 7:47 p.m., when the surveillance video show’s it leaving the neighborhood? Not likely. They would not get to Victorville until at the least, 7:20 p.m. and then they would have to dig two holes, with a shovel, which would take at least an hour to do, and then drive back to the McStay’s home to pick up the car. By then it would be after 10 p.m. But let’s also consider that the graves could have already been dug. Note: on 6/11/15 – Defense attorney Mettias stated there were two different set of tracks left at the graves. Is it possible that one set was made when the graves were dug and the second set was made when the bodies were put into the graves? Thus, two different vehicles? 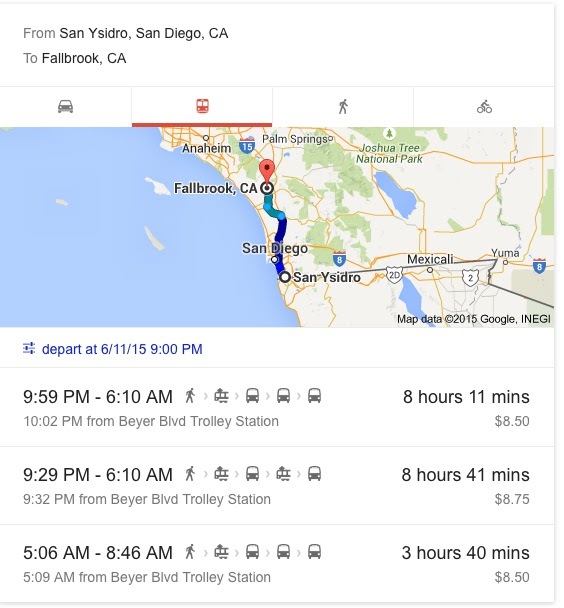 Add on the time to park the truck several blocks away and get out and walk to the McStay home in the dark and jumped into the Trooper and drive it to the San Ysidro border it would be at least 10:30 p.m. by then and we know the Trooper left earlier that evening. The murders could have happened much earlier in the day than was first thought. the Trooper was left at the border. Was the whole family together or is it possible that Summer and the boy’s were abducted sometime that evening and the person used Summer’s phone via a text to tell Joseph to meet them at a location? Maybe. Now that we can rule out a Bobcat was used, then a shovel would have had to been obtained. Has anyone checked to see if the McStay’s had a shovel and if it was missing? If the tracks were caused by the killer’s vehicle, because we know the track width of both of the McStay’s own vehicle does not fit, then we can only hope that the police hurry up and obtain search warrants so that vehicles can be searched for evidence and DNA. We can also probably cross some people off the list that do not own a vehicle, let alone a truck, unless they borrowed someone’s truck during the time. Lastly, many people have commented on how in the world could tire tracks still be embedded in the ground after 3 years. I believe rain may have helped. On average, February is the wettest month for Victorville, but in January 2010 it rained more than February 2010. Add in the weight of the truck with five people and possible firewood and that ground could have been soft enough so that tire tracks left an impression, that have remained to this day. 1. I've read that in the video were Mike McStay talks to the necrosearch guy (tim miller?) he says Chase Merritt had a chevy silverado 2500. 2. I'm guessing anyone owning one of these trucks owns or has access to a shovel. 3. If the information we have heard about the white truck and the missing bedding is accurate, combined with your findings here I think some details about what likely happen are starting to come together. Namely that the assault likely occurred in the home and maybe not all at once. 4. Makes you wonder when the trooper left on the night of the 4th was the family even in it at all. The call from Joey on the night of the 4th to Chase Merritt was the call actually made by joey or was it just made by joey's phone. WELL DONE!! p.s. lets hope the wording in the daily mail article implying, without actually stating, that Mike Mcstay had to tell the police about the tire tracks is just them intentionally miss-wording things to be over dramatic (they are famous for this). Because if they actually missed that HOLY @#$%. To me it looks like they backed up a truck and dug and probably dumped them into the graves from the back end. Every case I read I swear involves a white truck. If you look on google maps at above their house on satellite there's a white trucked parked behind another car by their old house. That picture is from 2013 it says. So maybe neighbor might be off on what they saw. Maybe they saw it another day who knows. Or maybe they did see that. I think that was pretty ballsy to bury them rather close to the freeway though. The angle to the freeway is interesting too. I can only go by the really bad video of the location on youtube. I tried searching google maps but couldn't find it.I don't think one in a location like that would go through the trouble of bringing out a bobcat. Whomever this person was thought it out but wanted to rid of everything rather quickly. I do not understand how there's no evidence from the dropped off car. Someone either had someone follow them there to pick them up or they caught a cab or ??. Of course no footage of that place. This case is extremely hard to figure. It feels like more than one person involved though one person could have done this. Pretty much all the motives really aren't that great to murder a whole family. Why go through all of that? Even if it were for say money. Why would they just not get him alone on his trip? I would think that would have been much easier for someone. So it seems to sway on what and whom would profit from all of them gone? Even if they were involved with something shady why didn't they take his money and other stuff. It really don't seem right. This cartel thing is a joke. They would not go through all these dramatics. They were thoughtful at burying them. The way they were buried. You have to think how paranoid this person had to be carrying bodies in a truck or what not then to just drive off that closely to freeway. Makes me wonder it might be someone who likes to go out there or use to for dirt biking or buggies. Someones just not going to randomly drive to that place with bodies in the car without having some sort of idea where to rid them and quickly. Obviously they probably did this in the dark and probably most likely that night unless they were transported from a whole other location which the phone call pings I'm confused by. Those from what I read were in a whole different area. Which this whole time I assumed they were killed there then moved. I don't think they were killed right there in the open in the desert. That would be even more ballsy. But who knows. We know one person was tied. Maybe that's the person who was the direct target. You have to think where was there car before it was found? There has to be another location involved right? Or am I missing something? I have an better idea what happened. They were moved to another secluded area. They were killed there and the car with the phones were left in a hidden location. As this person or persons transported them into another vehicle and buried them. They later returned to there vehicle and then relocated that vehicle where it was later found. Why I think outdoor secluded because the phones. Had they done this say at another house they would have shut them off. Somewhere it didn't matter. Maybe they didn't get buried there because of evidence. I was thinking why not just leave them there. In order to really confused and throw off people they did this very intricate thing. Maybe this is a jealously thing. I can speculate all day but if they could at least find that location (maybe it's by the bridge) they might figure this out better. The pings were not that far and their car had to be sitting somewhere during this whole ordeal. Two people sounds more likely but again if one had a gun maybe they tied the one in the car and held it to driver at gun point to drive to a location. They might not have put up a fight in a situation like that. Maybe J had one last chance and hit his phone for help. Which makes me think the women was tied but I have no idea. Oh, and they keep focusing on no forced entry. It could have been as simple as a knock on the door with a gun and they forced themselves in that way. A few scenarios but that one is not one I hear. Not unheard of either.